I remember that once, years ago when I was barely a teenager, my mother invested in an old-fashioned, hand-cranked food grinder and immediately went about making pastel de choclo; she was able to use the grinder to prepare her own ground beef as well as grind her own fresh corn. I’ll admit that the texture that a hand-cranked grinder gives to the corn makes for a more solid and dense cake, but I have to admit that I just grind the corn with an electric food process and it turns out just fine. 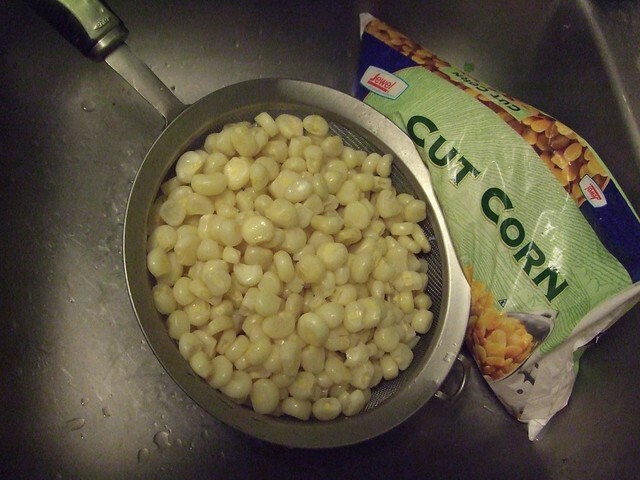 You can even use bags of off-the-cob frozen corn kernels. The only things to avoid are cans of corn or creamed corn; the liquid used in the canning process increases the moisture levels of the corn and messes with the proportions for this recipe. 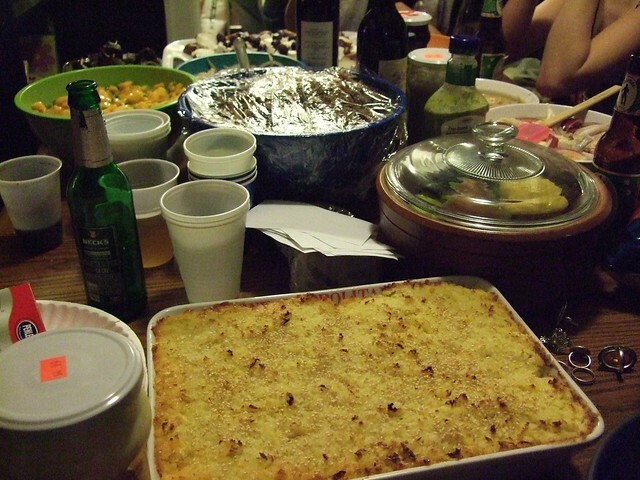 A pastel de choclo is a dense savory cake made from ground corn layered with seasoned ground beef. 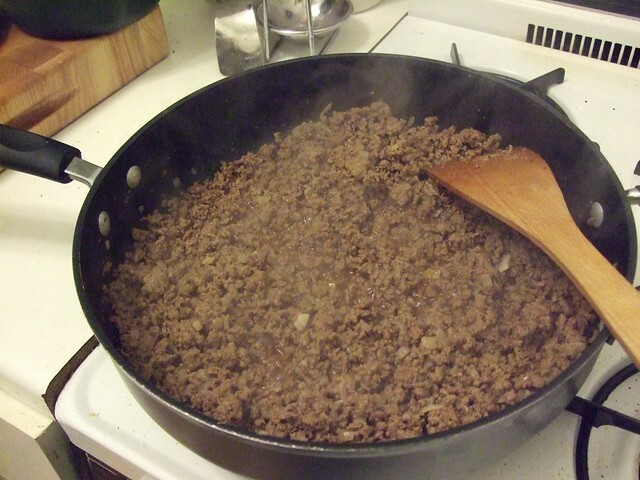 The ground beef filling is prepared first by browning it in a skillet with spices and aromatics. While the meat is left to cool, the corn is ground into a paste and then cooked in a skillet with butter and sugar until thickened. 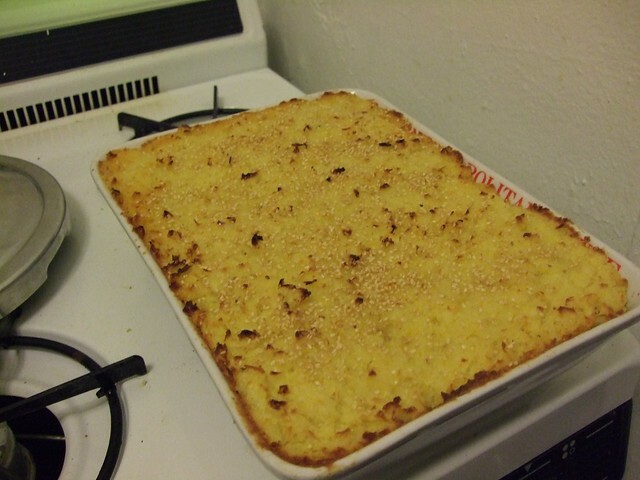 The corn paste and ground beef are layered into a casserole dish or earthenware bowl and then baked until bubbling on top. 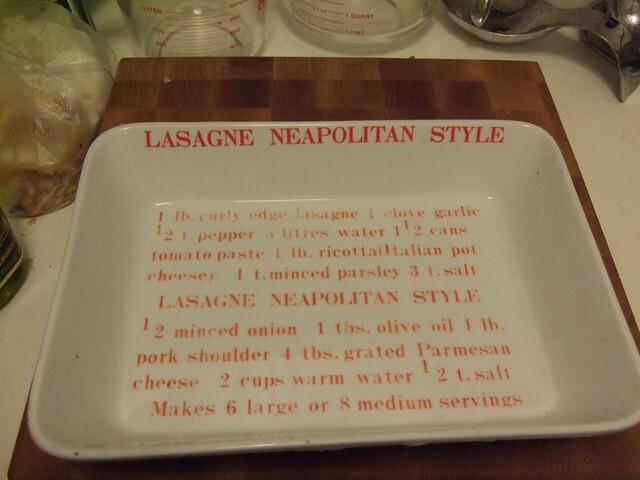 There are lots and lots of possible substitutions and alterations to this recipe. To begin with, this recipe can be made vegetarian by omitting the pino (ground beef filling) and instead making a solid block of corn cake. 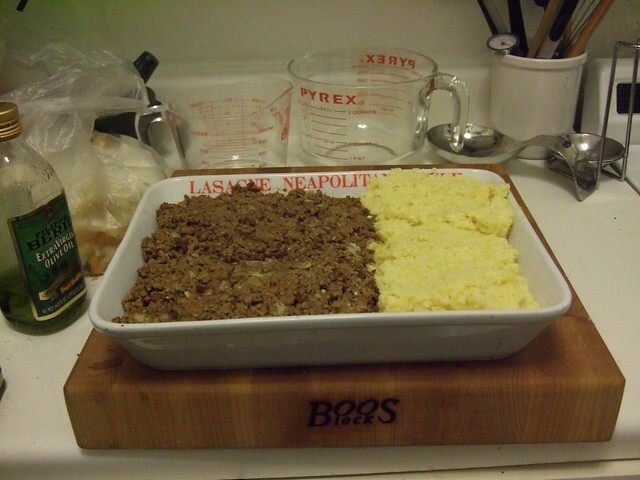 The recipe can also be made gluten-free by not using flour to absorb some of the grease in the ground beef, but instead draining the grease before cooling. 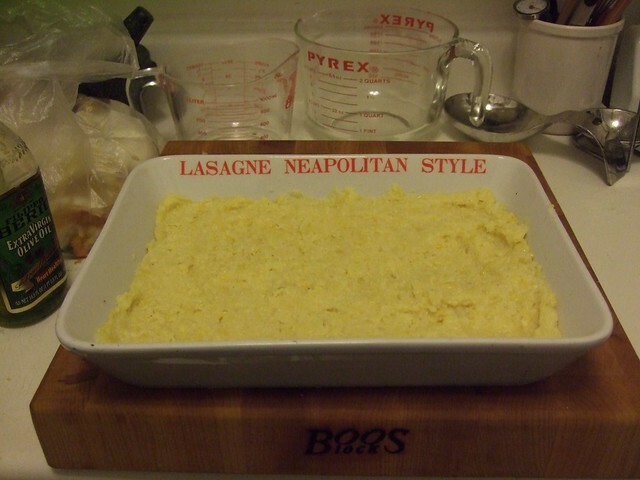 The pino usually is made up of garlic, onions, ground beef, cumin, and some paprika. 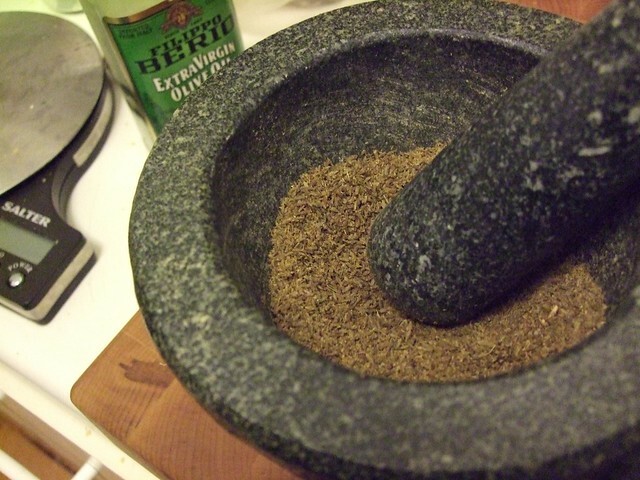 The spices can be substituted (for example, the paprika could be replaced by ground chili peppers or some aji rocoto paste), and some recipes also add raisins, diced hard-boiled eggs, or olives. 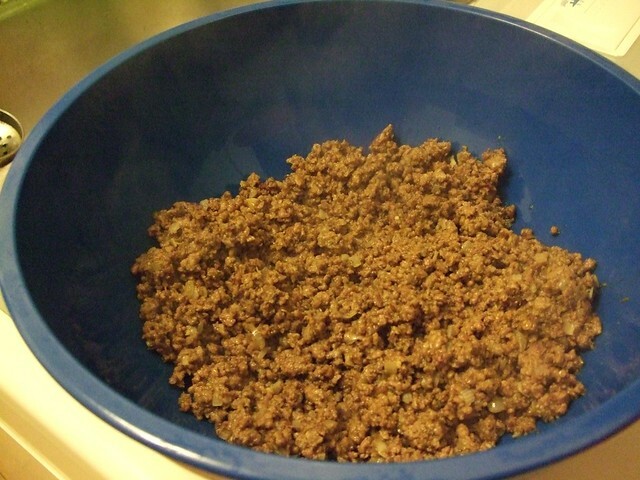 The beef can also be substituted with other ground meats (lamb, pork, turkey) or even vegetarian substitutes. The corn paste is usually sweetened with some sugar and pre-cooked in butter; it is sometimes flavored with basil leaves. Also, you may need to add corn meal and/or corn starch to the corn paste if you’re using regular American yellow corn, since it is less starchy and more moist than the white choclo that the traditional recipe uses (see the Tips section below). The corn can be replaced by potatoes or yucca (cassava), but I’ve never tried it; I don’t see the point in making a pastel de choclo without corn, but my mom insists that it’s a valid variation. 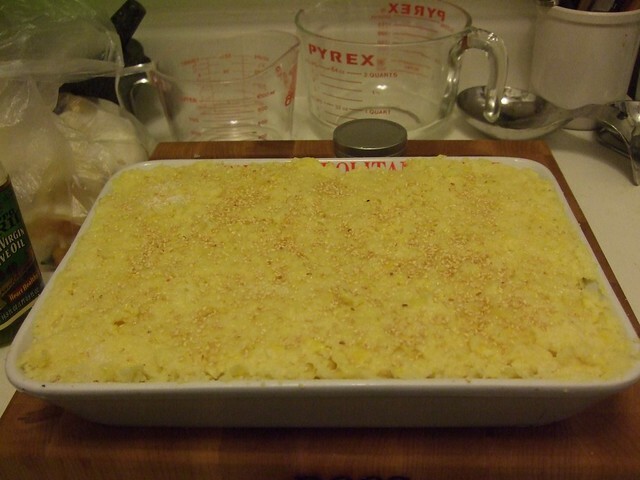 The traditional arrangement of the pastel involves a single layer of pino covered by a single layer of corn paste, but I tend to put a thin layer of corn paste at the bottom of the casserole, which I find helps it cohere when it is cut into pieces. The assembled pastel is often dusted with sugar and sesame seeds before baking. VEGETARIAN version: leave out the pino and make the whole cake out of corn (or use a vegetarian substitute for ground beef). 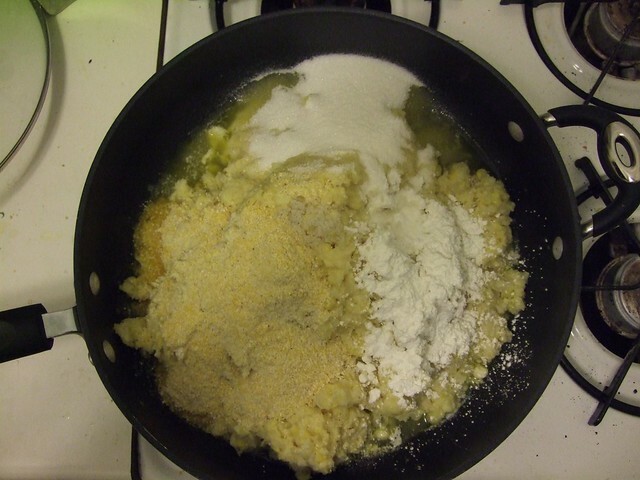 GLUTEN-FREE version: do not add flour to the pino to make it thicken, but instead drain off most of the grease. choclo vs. american sweet corn: the original recipes all assume that you’re using white, large-kerneled choclo,which is a kind of corn that is drier and more starchy than American sweet yellow corn. You can sometimes find bags of frozen choclo in South-American food specialty stores (especially ones that specialize in Chilean, Bolivian, Peruvian, or Ecuadorean foodstuffs). If that doesn’t work, you can use regular yellow corn, but you’ll need to add some corn meal and some corn starch to help the corn paste bake into a solid mass. In the ingredients list below, I’ve included the amounts of corn meal and corn starch that you would need if you were using yellow corn; if you manage to find some choclo, adjust or eliminate these thickening agents, according to the proportion of choclo to yellow corn. DO NOT try to use canned corn or creamed corn as a substitute. They are far too watery and you’ll end up with a sort of runny porridge instead of a savory cake. 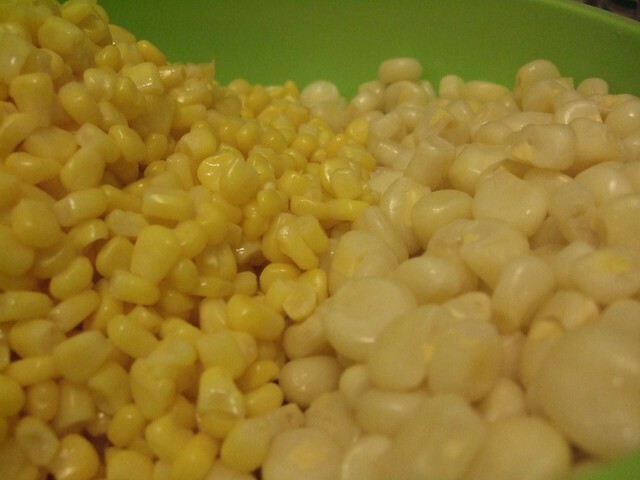 See the image below for a side-by-side view of yellow corn vs. choclo. nothing. Often eaten cold as a snack or a form of street-food. 1. If your corn is frozen, thaw it out by leaving it at room temperature for an hour or two (preferably in a sink or a bowl in case water leaks out). If it’s fresh on the cob, cut it off the cob and put it in a large bowl. 3. 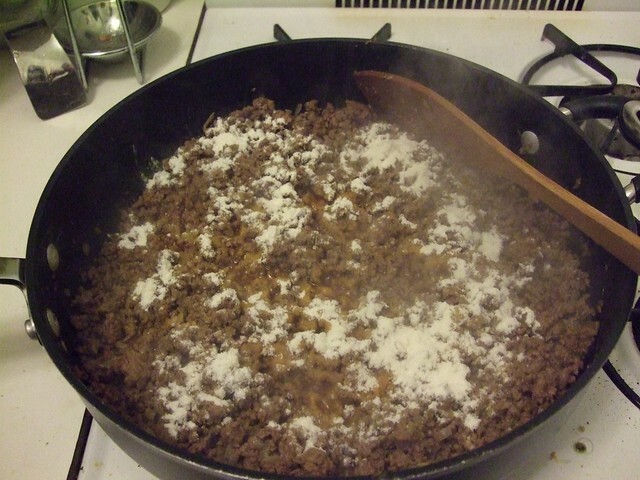 Pino (the filling): In a very large pan over medium heat, place the ground beef and the finely-diced onion and garlic. Don’t bother with any oil, as the fat from the beef will provide all the grease you need. 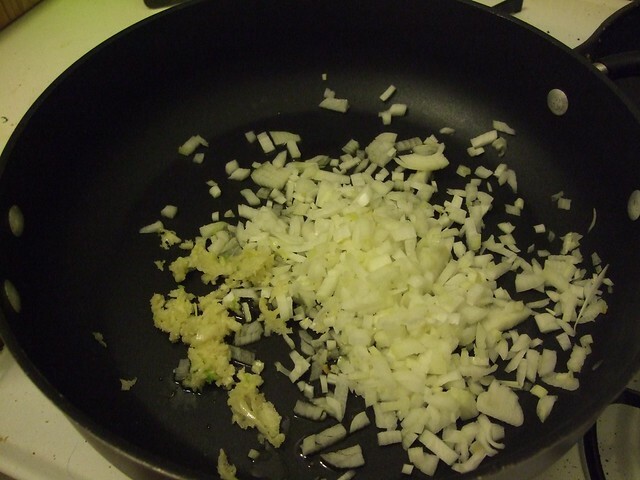 Break up the meat with a wooden spoon and mix with the onions and garlic. 4. 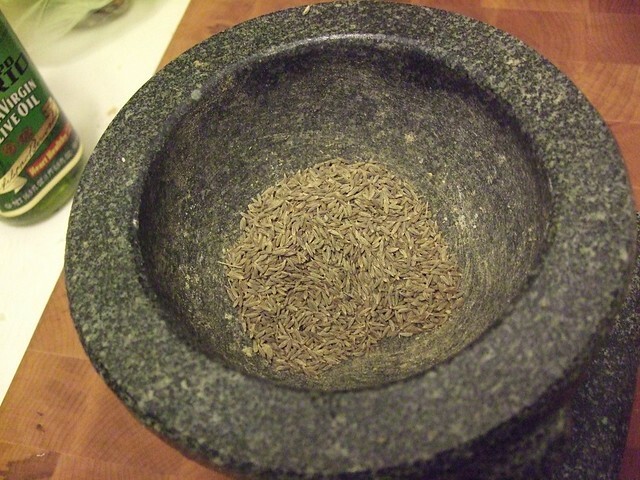 Take the cumin seeds and grind them finely in a mortar or a spice grinder. Add to the pino and mix. 6. 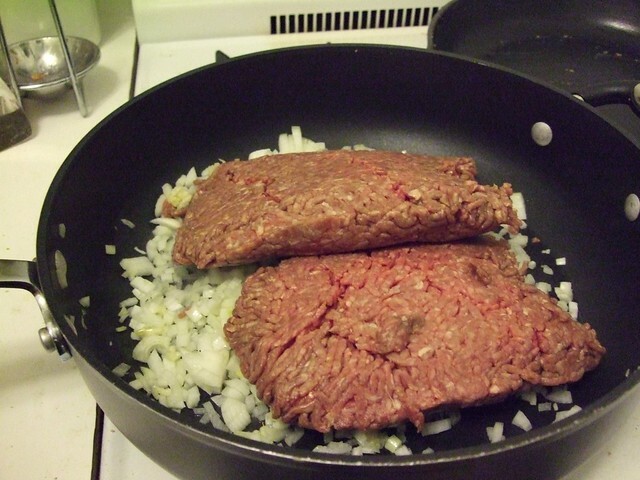 Allow the pino to cook over medium heat, stirring occasionally to break up clumps of meat, until the beef is well-browned (see picture). 7. Unless you bought extra-extra-lean ground beef, there’s probably a fair bit of grease in your pan now. You have two choices. You can drain most of the grease out of the pan (gluten-free-friendly option), or you can sprinkle about two tablespoons of flour over the meat, mix thoroughly, and allow about 5 minutes for the flour to cook and absorb the fat. Repeat if necessary, until the pino is relatively dry; then, move it to a large bowl and allow it to cool. 8. Rinse your pan and place over low heat. 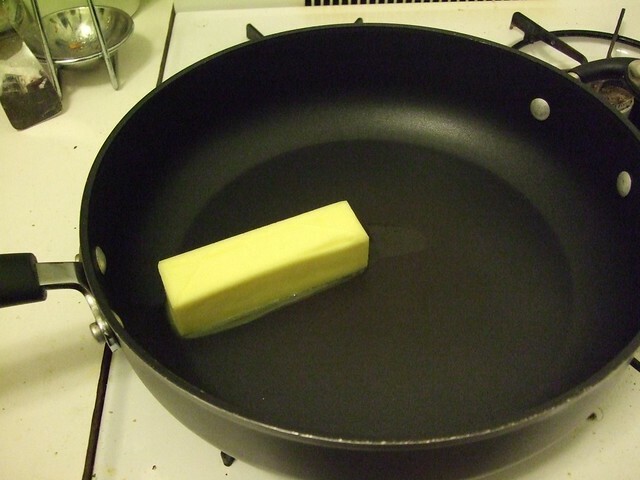 Place butter in the pan. 9. 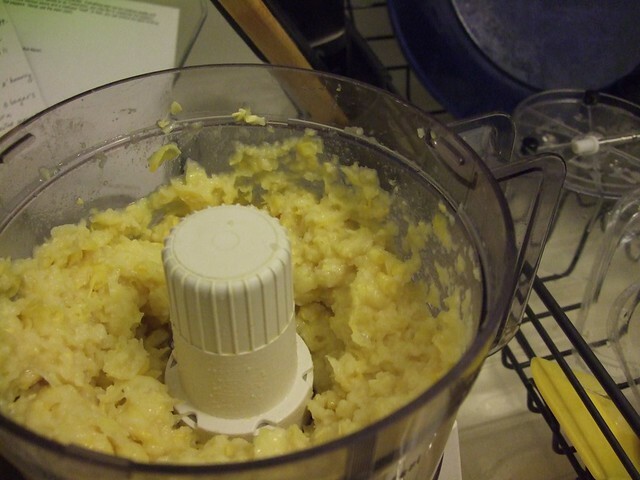 While the butter melts, puree the corn in batches with a food processor. 10. 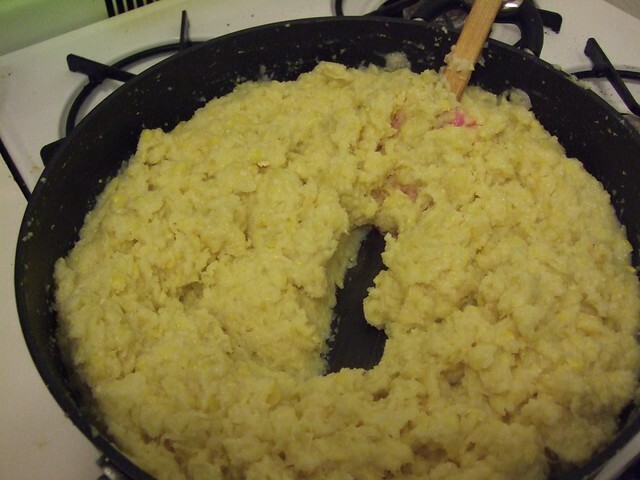 Place the corn puree in the pan, add the sugar, corn meal, and corn starch, and mix well. If you are using only yellow corn, use the proportions of corn meal and corn starch listed in the ingredients above. If you’re using a 50/50 mixture of yellow and white, reduce these proportions by half. 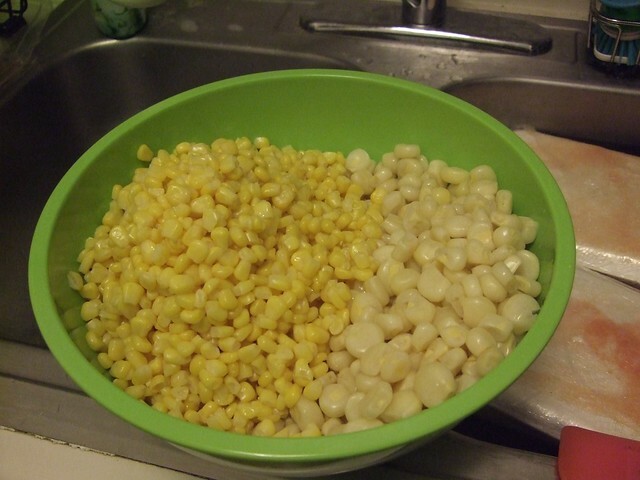 If you’re using only white corn, do not add any corn meal or corn starch. 11. Cook, stirring occasionally, until the corn begins to get shiny and translucent. Remove from heat. 12. In a large, deep, oven-safe dish, place a little less than half of the corn mixture and smooth along the bottom to create a flat layer. 14. Carefully lay the final layer of corn mixture by placing them in evenly-spaced dollops and then smoothing out with the back of your spoon. Sprinkle the top lightly with sugar and sesame seeds (optional). 15. Cook at 375ºF (190ºC) until the top of the corn mixture is bubbling gently (usually 40 mins). Then, turn the heat up very high and check every 1-2 minutes until the top begins to turn golden brown. Be careful! This can burn very easily. 16. Remove from heat and allow to cool. The “pastel de choclo” can be served warm or cold.